10 Page Instruction manual that details exactly how to setup and install everything from the silver screen to aligning the projectors. 6 Channel High Definition Audio, 10/100Mbps Ethernet Network Card, Dual Layer DVD Burner & Rom, Top Quality memory & hard drive. 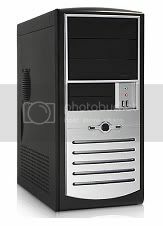 PLEASE NOTE: This PC is for dual polarized 3D projection where two matching projectors, polarizers, polarized 3D glasses & a silver screen is required and this PC does not come with any of the accessories. Also a Preview monitor is recommended (which can be any PC monitor CRT or LCD). Take advantage of our flat rate shipping where you can order as many items as you like worldwide for our low flat rate!